My first automobile race was an autocross in a parking lot at Tennessee Tech University. The race was held by the Golden Eagle Sports Car Club. I popped off the hubcaps from my Datsun 710 and aired up my Michelin XZX tires. I was quite sure that I would be able to score at least a class win it not the fastest time of the day driving around the little course made up of construction pylons. That is, if I could just remember where the course went. My heart was pounding and my palms were sweaty as I pulled up to the timing light to start my run. I soon learned a lot about my car and my ability to drive it as I found out that no matter how far I turned the wheel, if I entered a corner too fast, my car would just go straight. I had just discovered under steer! Watching the other drivers maneuver their cars around the course, I was amazed at the control they had. I was sure they had made huge modifications to their cars to make them handle like that. I was convinced that it was tires, or shocks or a million other expensive parts that they must have hidden in their cars. It took me quite a while to accept that it was really just their skill at driving the car that made them faster than me. Either through instinct or more likely by lots of study and practice, they knew how to make a car maneuver around a tight twisty autocross course. Before I finally began to accurately perceive the reality of the situation, I spent a lot of time and money trying to make my car go faster and handle better. I read books on how to make a car handle and how to improve my suspension. I entirely overlooked working on the big nut behind the wheel. I never made any real improvement in my autocross times until I accepted that I needed to work more on my driving skills and not so much on the car. In fact, I had pretty much lost interest in autocross racing before I fully accepted this fact of life. My next great motor sports adventure was Road Rallying. Jeff, my former college roommate, became my navigator. Together we developed a computer software program to aid in our time keeping. We did not put much effort at all into studying the products that were commercially available because we felt they were out of our budget. We simply focused on what were could build with our limited resources and the features we wanted in our computer. We became successful quite quickly. We even took home a couple of first place trophies in National Championship level events. We probably could have been competitive on the national circuit had we been willing to invest the time and money into travel needed to compete in events scattered all over the country. Our work situation made it very difficult for us to both be gone the same weekend, so we let a lot of those things get in the way of pursuing our hobby. What we did not realize at the time was that our little computer program had a few features that the commercially available computers did not have. After some of the top competitors saw what we could do, they forced the main manufactures to add those features to their products. We, of course, got no credit for our ingenuity. In this case, we never really accepted how good we really were. We often lost rallies right near the end due to our inexperience or sometimes we would frustratingly loose them in claims after the rally. Had we accurately perceived the reality of the situation, we could have made a much larger contribution to the sport and had a lot more fun. As it was, our inaccurate perception allowed us to let other interests take over our passion for road rally. We never really tried to market our computer program. Had we accepted just how good we really were at that sport and what natural talent we had, I am sure we would have made some money and had a lot more fun. My next automotive endeavor was organizing Rally Races. These events were huge fun to be involved in. Lots of people came together from various backgrounds and with various skills to make the event a success. The highlight of this phase of my life was the Cherokee Trails International Rally. It was a three day event in the Cherokee National Forest. Racers from all over the world came to challenge the gravel roads of east Tennessee. The event was won by an Irishman on St Patrick’s Day. There was much rejoicing. Again here I failed to see the level of my own skill. I did not have the confidence to speak up where I saw things that were not being done properly. Since I did not have as much experience as some of the others, I deferred to their ideas. I failed to accurately perceive that these people really did not have the skills needed to maintain an event of this caliber. I also did not accept that my social skills were not good enough to build strong relationships with the key players so that they would listen to my ideas. Again, I found myself wasting effort working on the wrong things due to my inaccurate perception of the reality of the situation. I failed, or more likely refused, to accept what I was observing. The rally organizing led me to building my own rally racer and racing it in several rallies. At the same time, I was enjoying the new sport of Rally Cross racing. By this time I had learned that the most critical element of this type of racing was driver skill. Picking a good line through the course was also very important. I learned quickly that getting familiar with the course was way more important than tire pressures or weight distribution. I also accurately assessed that there were people who were much better at creating a new line through the grass than I was. I always tried to walk with them when possible and I definitely watched their runs to see what I could learn. Through accepting my strengths and weaknesses in this sport, I was able to win many class victories as well as a few “fastest time of the day” driving my Jeep Cherokee against what should have been much faster cars. I also enjoyed the sport of Rally Racing. Pumped up by the success of Rally Cross racing in the Jeep, I decided to build a dedicated race Jeep. What I failed to accurately assess about this reality was how heavy and underpowered my vehicle of choice was. It’s handling and reliability were great, just not the power to weight ratio. I also did not accept my inability to drive at high speeds with very little control. I enjoyed the races and I did pretty well in events where the roads were tight and twisty. I did really poor where the roads were more open and top speed became a factor. I was just not willing to maintain momentum over crests and around curves where I was not sure what was on the other side. It took me a few races to fully accept that I was never going to be the next Colin McRae. 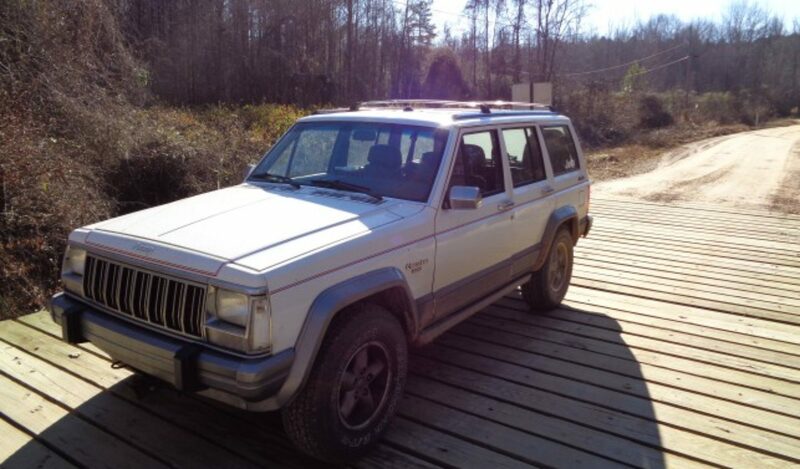 I did spend some more money on the Jeep just in time for my favorite race – Cherokee Trails – to be cancelled forever. It took a few more months for me to accept the fate of the Rally Racing Jeep. I had just met a new group of friends who shared many common values and a love for Jeeps and driving them off road. I quickly built a Cheap Jeep to see how I would enjoy the sport of off road driving. I did a couple of trips with this Jeep before I accepted that I really did enjoy off roading much more than any form of motor sport I had tried up to that point. After that second trip in Scuffy, I went home and began converting the rally racer into a true off road machine. It took some commitment to finally cut the rear fenders to clear the big tires. But, by then I had accepted that I would never really be competitive in Rally Racing. Also, through a lot of encouragement from my new friends, I quickly accepted that I have a lot of natural skill at off road driving that I could quickly build from. Getting Scuffy II’s first dent was another lesson in acceptance. I was surprised that it really did not bother me much. In fact I saw it as a badge of honor. A battle scar! Now, I look forward to each outing to see how much more I can push myself and enjoy building my off road driving skills. Learning to accept the reality of a situation is the key to improving it. This concept is critical no matter what process you are trying to improve. Whenever you are trying to improve any aspect of life, be sure to accurately assess the situation. What are your real strengths and weaknesses that are factors? What skills do you need to develop? What machinery or automation will make the process more effective? Acceptance is the first step in process improvement. Learning how to properly assess the current state of a situation is one of the most import lessons I have learned from driving off the road. This past weekend at 100AW I got to spend a little time with Ken Block. Ken won the 100 Acre Wood rally in his Subaru. Here is a cool video of him doing some fun drifting. I love the way he lives his dreams! Kumho Ecsta SPT Colored Smoke Tire priced from $127.